In the country's second city of Cap-Haitien on the north coast, the demonstrators torched a police station after confronting U.N. troops, while in Hinche in the central region, they pelted Nepalese U.N. peacekeepers with stones. "The whole city is blocked, businesses and schools have closed, cars have been burned. 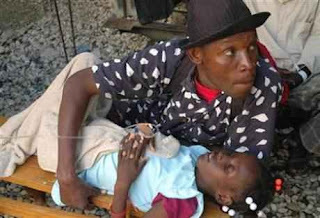 It's chaos here," a local businessman in Cap-Haitien, Georgesmain Prophete, told Reuters. There were no immediate details of any casualties. A cholera epidemic, which broke out last month, has killed more than 900 people in the poor earthquake-hit Caribbean country, and the U.N. mission has repeatedly denied widespread rumors that Nepalese U.N. troops quartered in the central region brought the deadly disease to Haiti. The U.S. Centers for Disease Control and Prevention (CDC) has said DNA testing shows the cholera strain in Haiti is most closely related to a strain from South Asia. But neither the CDC, the United Nations or the Haitian government has linked the outbreak to the Nepalese. Experts say that while Haiti's poverty and poor sanitation have been major factors in the spread of the outbreak, cholera had been absent from the country for decades. But they said it would prove very difficult to trace the source with certainty, or determine how it had re-entered the country after such a long absence.